The EU and Turkey have now reached an agreement on refugee issues, which has aroused considerable legal and political controversy. To examine the arguments about the deal, I present here the main text with my legal assessment of each point annotated. This builds upon my comments (together with Emanuela Roman) first of all in general on the relevant points last month, and then secondly on the leaked draft text of the final deal earlier this week (I have reused here some of the latter analysis where relevant). The agreement should be read alongside the EU summit conclusions, as well as the Commission communication on the deal. It incorporates the March 7 EU/Turkey statement which addressed the same issues in less detail. The text of the deal is underlined below. The sections in bold have been added during negotiations, and the sections in strike-out have been removed. I have already discussed the legal status of the deal in the prior post earlier this week: it’s a statement that is not subject to approval or legal challenge as such; but its implementation in the form of specific laws or their application to individual asylum-seekers can be challenged. 1. All new irregular migrants crossing from Turkey into Greek islands as from 20 March 2016 will be returned to Turkey. This will take place in full compliance with EU and international law, thus excluding any kind of collective expulsion. All migrants will be protected in accordance with the relevant international standards and in respect of the principle of non-refoulement. It will be a temporary and extraordinary measure which is necessary to end the human suffering and restore public order, Migrants arriving in the Greek islands will be duly registered and any application for asylum will be processed indvidually by the Greek authorities in accordance with the Asylum Procedures Directive 2013/32/EU, in cooperation with UNHCR. Migrants not applying for asylum or whose application has been found unfounded or inadmissible in accordance with the said directive will be returned to Turkey, Turkey and Greece, assisted by EU institutions and agencies, will take the necessary steps and agree any necessary bilateral arrangements, including the presence of Turkish officials on Greek islands and Greek officials in Turkey as from 20 March 2016, to ensure liaison and thereby facilitate the smooth functioning of these arrangements. The costs of the return operations of irregular migrants will be covered by the EU. Migrants having been returned to Turkey will be protected in accordance with the international standards concerning the treatment of refugees and respecting the principle of non-refoulement. The newly added first sentence is a flagrant breach of EU and international law – but the rest of the paragraph then completely contradicts it. To be frank, anyone with a legal qualification who signed off on this first sentence should hang their head in shame. Returning ‘all’ persons who cross from Turkey to the Greek islands would contradict the ban on collective expulsion in the EU Charter and the ECHR, as well as EU asylum legislation. However, it does appear from the rest of the paragraph – including the newly added reference to non-refoulement (not sending people back to unsafe countries) – that this is not really the intention. As for the rest of point 1, the first question is how ‘temporary’ this arrangement will be. Secondly, point 1 makes clear that the EU’s asylum procedure directive will apply to those who reach the Greek islands, as legally required. Note that the text does not refer to Greek waters: but the Directive explicitly applies to them too. It does not apply to international or Turkish waters. It is not clear what is planned as regards those intercepted before they reach the Greek islands. As for ‘migrants not applying for asylum’ the crucial question is whether they will be given an effective opportunity to apply for asylum, as the Directive (and ECHR case law) requires. If an irregular migrant does not apply for asylum then in principle there is no legal obstacle to returning them to Turkey, subject to the conditions set out in the EU’s Returns Directive. Note that the Greek authorities will have to consider the applications, which is a significant administrative burden; this implicitly reiterates the closure of the route via the Western Balkans. The EU’s decisions on relocation of asylum-seekers from Greece and Italy (discussed here) will implicitly continue to apply, but they only commit to relocating a minority of those who arrive in Greece, and they are barely being applied in practice. If an application is ‘unfounded’ that means it has been rejected on the merits. If it is ‘inadmissible’ that means it has not been rejected on the merits, but on the grounds that Turkey is either a ‘first country of asylum’ or ‘safe third country’ (there are other grounds for inadmissibility, but they wouldn’t be relevant). The Commission paper briefly suggests that Turkey could be a ‘first country of asylum’ (for more analysis on that, see the prior blog post). Most of the debate is on whether Turkey is a ‘safe third country’. Is it? The commitments on treatment in Turkey have been moved from this statement to the separate summit conclusions. 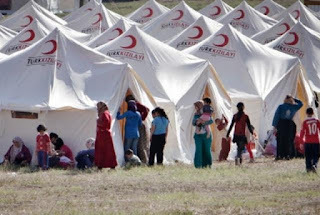 Treatment in Turkey will need to match EU rules in the procedures Directive, which define a ‘safe third country’ as a country where: the people concerned do not have their life or liberty threatened on ground of ‘race, religion, nationality, membership of a particular social group or political opinion’ (this test is taken from the Geneva Convention on refugee status); there is ‘no risk of serious harm’ in the sense of the EU definition of subsidiary protection (death penalty, torture et al, civilian risk in wartime); the people concerned won’t be sent to another country which is unsafe (the non-refoulement rule, referring specifically to the Geneva Convention, plus the ban on removal to face torture et al as laid down by ECHR case law); and ‘the possibility exists to request refugee status and, if found to be a refugee, to receive protection in accordance with the Geneva Convention’. As set out in the previous blog post, the last point is questionable because Turkey does not apply the Geneva Convention to non-Europeans, and the best interpretation of this requirement is that it must do so in order for the clause to apply. However, this interpretation is not universally shared: the Commission, the Council, Greece and some academics take the view that it is sufficient that Turkey applies equivalent standards in practice. (Note that the Commission only selectively quotes the Directive to make this argument). Even if this latter interpretation is correct, whether Turkey does apply equivalent standards in practice might itself be open to question. Furthermore, again as discussed in the previous post, many NGOs argue that refugees are not always safe from mistreatment in Turkey itself, although no one argues that all of them are mistreated there. Equally Turkey allegedly returns some people (but clearly not all of them) to unsafe countries, and the deal explicitly plans for a ‘safe zone’ in Syria. Such a zone is conceivable in theory, but whether it would indeed be safe would have to be judged when and if it happens; and it may become less (or more) safe in light of events. To address these issues the procedures Directive says that the asylum-seeker must be able to argue that ‘the third country is not safe in his or her particular circumstances’. Everything will then turn on the assessment of an argument along these lines. A critical here is whether the case can be fast-tracked. The procedures Directive contains lists of cases where the administrative procedure can be fast-tracked, and where the appeal against a negative decision to a court doesn’t automatically entitle an asylum-seeker to stay. Note that those lists don’t refer to fast-tracking ‘safe third country’ cases, although in practice it may be quicker to decide a case without examining the merits. It is possibly arguable that the lists aren’t exhaustive. If Greece wants to take this view, the interpretation of these clauses will be crucial. If the cases can’t be fast-tracked, it will obviously take longer to return people to Turkey in practice. Member States can set up special ‘border procedures’, but there is no reference to fast-tracking applications in this context. Furthermore, Member States can’t apply fast-track or border procedures to ‘vulnerable’ applicants, as broadly defined, and can’t apply border procedures to unaccompanied minors. Odd as it might seem, the general state of human rights in Turkey (for example, as regards freedom of expression) is not directly legally relevant to returning refugees or other migrants there. The question is whether Turkey is unsafe, as defined in EU asylum law, for refugees and migrants. However, the general state of human rights in Turkey is relevant for a different reason: the Commission has separately proposed that Turkey be designated a ‘safe country of origin’, so that any refugee claims by Turkish citizens can be more easily rejected. I argued last September that this proposal was untenable in light of the human rights record of Turkey. In light of developments since, I’ll update my assessment: the suggestion is now utterly preposterous. But this proposal is not part of the deal. 2. For every Syrian being returned to Turkey from Greek islands, another Syrian will be resettled from Turkey to the EU taking into account the UN Vulnerability Criteria. A mechanism will be established, with the assistance of the Commission, EU agencies and other Member States, as well as the UNHCR, to ensure that this principle will be implemented as from the same day the returns start. On resettlement based on 1-for-l principle: a) Priority will be given to migrants Syrians who have not previously entered or tried to enter the EU irregularly, On the EU side, resettlement under this mechanism will take place, in the first instance, by honouring the commitments taken by Member States in the conclusions of Representatives of the Governments of Member States meeting within the Council on 22/7/2015, of which 18.000 places for resettlement remain. Any further need for resettlement will be carried out through a similar voluntary arrangement up to a limit of an additional 54.000 persons. The Members of the European Council welcome the Commission's intention to propose an amendment to the within the limits and in accordance with the distribution set out in [relocation decision of 22/9/2015 to allow for any resettlement commitment undertaken in the framework of this arrangement to be offset from non-allocated places under the decision. - non-allocated places]. Should these arrangements not meet the objective of ending the irregular migration and the number of returns come close to the numbers provided for above, this mechanism will be reviewed. Should the number of returns exceed the numbers provided for above, this mechanism will be discontinued. the number of returns exceed the numbers provided for by these commitments, this agreement will be subject to review. The idea of a ‘1-for-1’ swap of irregular migrants for resettled Syrians has been controversial, but does not raise legal issues as such. Resettlement of people who need protection from the countries they have fled to is common in practice, but is not a binding legal obligation under international or EU law. The legality of return of people to Turkey has to be judged separately (as discussed above) from the question of whatever trade-offs might be made in return for this. However, I certainly share the view of those who find a de facto ‘trade in human misery’ morally dubious. The ethos of resettlement is humanitarian; to demand a pay-off for one’s humanitarian actions contradicts their ethical foundations. The final text makes clear that resettlement will focus on the most vulnerable people. Note that if all resettlement from now on takes place from Turkey, then no-one will be resettled by the EU from Lebanon and Jordan, which also host large numbers of Syrian refugees. On the ‘low priority’ cases, it is open to Member States to prioritise resettlement on whatever criteria they like. Obviously the intention here is to deter people from attempting unsafe journeys via smugglers; whether that would work depends on the numbers who might be resettled. Overall, the EU has not increased the numbers of people that Member States are willing to accept: the first 18,000 are the remainder of the 23,000 people that the EU committed to resettle from non-EU countries last year, and the next 54,000 are the remainder of those who were going to be relocated from Hungary, before that state rejected the idea last September. However, unlike the mandatory quotas under the EU’s relocation decision, these numbers will be voluntary. The final deal makes clear that the maximum member of people who will be returned on this basis is 72,000: this part of the deal ends once the number of returned irregular migrants hits that number, or if the levels of irregular migration stop. In the latter case, the EU will move to a voluntary humanitarian admission scheme, discussed below. In the former case, it is not clear what will happen. 3) Turkey will take any necessary measures to prevent new sea or land routes for illegal migration opening from up out of Turkey and into to the EU, and will cooperate with neighbouring states as well as the EU to this effect. This refers to Bulgarian concerns that people might try to cross the Black Sea as a new entry route. Of course, if people do make to Bulgarian territory or waters, the EU asylum laws would apply, as they do for Greece. 4) Once the irregular crossings between Turkey and the EU have come to an end are ending, or at least have been substantially and sustainably reduced, the Voluntary Humanitarian Admission Scheme will be activated. EU Member States will contribute on a voluntary basis to this scheme. This scheme is set out in a Commission Recommendation from December, as discussed in detail here. Note that the text was amended to make clear that irregular crossings would not have to stop entirely; that was an obvious fantasy. This commitment is transposed from the March 7 statement. The waiver of short-term visas only applies to the Schengen States, and applies for stays of three months. Under the EU/Turkey readmission agreement, Turkey will have to take back anyone who overstays. It will still be necessary for Turkey to meet the relevant criteria, and for the EU Council (by qualified majority vote) and the European Parliament to approve this change in EU law. 6) The EU, in close cooperation with and Turkey, will further speed up the disbursement of the initially allocated 3 billion euros under the Facility for Refugees in Turkey and ensure funding of additional further projects for persons under temporary protection identified with swift input from Turkey before the end of March. A first list of concrete projects for refugees, notably in the field of health, education, infrastructure, food and other living costs, that can be swiftly financed from the Facility, will be jointly identified within a week. Once these resources are about to be used to the full, and provided the above commitments are met, Furthermore, the EU will mobilise decide on additional funding for the Facility of an additional 3 billion euro up to the end of 2018. [X] billion for the period [Y] for the Turkey Refugee Facility. The amount and timing of additional money from the EU and its Member States was agreed during negotiations. Details of the timing of disbursements and the nature of the spending projects have also been added. Note that this money is not, as is widely assumed, simply handed over to Turkey: legally speaking it can only be spent on projects that assist the Syrian refugee population. The Commission paper sets out further details of how the money will be spent, starting with a contract to provide food aid to over 700,000 Syrians. This refers to an intention to extend the existing customs union to cover services and investment issues. 8) The EU and Turkey reconfirmed their commitment to re-energise the accession process as set out in their joint statement of 29 November 2015. They welcomed the opening of Chapter 17 on 14 December 2015 and decided, as a next step, to open Chapter 33 during the Netherlands presidency. They welcomed that the Commission will put forward a proposal to this effect in April. Preparatory work for the opening of other Chapters will continue at an accelerated pace without prejudice to Member States' positions in accordance with the existing rules. Ultimately the EU and Turkey agreed to open only one new chapter out of 35 which need to be agreed in order for Turkey to join the EU. Only one chapter has been closed so far in a decade of negotiation. There is no commitment to open or close any further chapters. Even if an accession deal is ever negotiated, there are many legal and political obstacles in the way of it being approved, as all Member States’ parliaments would have to agree. This refers to an intention (as noted above) to create a ‘safe zone’ within Syria. Whether this is viable or not remains to be seen. If there is any dispute about its safety, then returning Syrians to Turkey would be problematic if Turkey intends to send them further on to the alleged safe zone. Overall the final deal tries to address the two main legal concerns about the March 7 ‘deal’. It makes clear that the EU asylum laws will apply to those who reach Greece (subject to the caveat about what happens to those intercepted in Greek waters), and that Turkey will have to meet the relevant standards when taking people back. The intention to ‘make the deal legal’ is clearly undermined by the extraordinary statement that ‘all’ irregular migrants will be returned. The key legal question will be how these commitments are implemented in practice. The main legal route to challenging what happens should be by asylum-seekers through the Greek courts. Those courts could refer questions to the CJEU about EU asylum law (the CJEU could fast-track its replies). Alternatively if the asylum-seekers have gone through the entire Greek court system, or cannot effectively access the Greek system they could complain to the European Court of Human Rights (which is separate from the EU), and claim that there is a breach of the European Convention of Human Rights. In practice, however, it may be that access to lawyers and courts is more theoretical than real. It is unfortunate, to say the least, that the EU did not try to ensure beyond doubt that the deal was legal, by putting in place some sort of effective monitoring of Turkish commitments as regards the treatment of refugees and migrants, in particular asking Turkey to fully apply the Geneva Convention to all refugees as a condition of the deal. After all, the EU will now be meeting a significant proportion of the costs of housing refugees in that country. It is even more disturbing that some Member States want to arrange for expedited returns to Libya. Surely before too long, the CJEU will asked to interpret the definition of ‘safe third country’ in EU asylum law. That finding will be crucial in determining whether it really is legal to return people to Serbia, Turkey, Libya and possibly other countries besides. It is absolutely out of the question, at this time, to imagine that the Greeks can construct an asylum system in conformity with EU law and that could hear cases reasonably quickly, and also allow appeals. As I mentioned in a previous post, the country's legal system is now in chaos. Adding to that the burden of maybe 500,000 asylum applicants in a year (if all the Syrians, Afghans and Iraqis continue to reach Greece and are forced to apply for asylum in order not to be sent back to Turkey), and one can see only chaos and catastrophe. Concerning interception at sea, is this not covered by Reg 656/2014? I think the EU is rather hoping that people will simply be deterred from coming to Greece. Obviously that remains to be seen. The 2014 Regulation applies where Frontex is coordinating interception. I don't know how much of the current interception between Greece and Turkey is coordinated by Frontex. But I can't see how that Regulation could override the wording of the asylum legislation. BTW, sorry to ask here, but could you reply to my last email? It is quite urgent! Breaking news: Greece will not recognise Turkey as a safe country for asylum returns. Do you have a source, Martin? With all the efforts they have made to set a new policy in motion I find it hard to believe that they are not going to do something along these lines. Just found you in the middlle of this discussion! I think agreements concerning asylum seekers need to pass through the EU parliment. and the Council is not doing that ....This is a big strategy to bypass the non refoulement clause. Any way, what s your email? Let's chat! Excellent, again, Steve. And fast as lightning! It is obviously technically correct to note that the "newly added first sentence [stating that ALL migrants will be returned to Turkey] is a flagrant breach of EU and international law" and that the rest of the paragraph contradicts this. However, I feel it may be worth noting that in terms of the general point that the EU is trying to make, it would be correct to state that ALMOST ALL migrants will be returned. All applicants found not to be in need of international protection will be returned, and given that Turkey is to be recognised as a safe third country, the only applicants who actually are in need of international protection that will not be returned will be those that can demonstrate that Turkey will not be safe for them in their particular circumstances. Given that the vast majority of those seeking international protection are fleeing persecution and conflict in countries such Syria, Iraq and Afghanistan, it seems likely that very few of them will be able to demonstrate that Turkey will be more dangerous for them than for other refugees or asylum seekers. Therefore, the vast majority of migrants would appear to be eligible for removal from Greece to Turkey. Of course, the EU should be capable of issuing statements that both get its points across and are technically accurate. But claiming that Turkey is a 'safe third country' does not make it necessarily so. The argument will be that Turkey does not meet the criteria to be defined as 'safe', in particular that it does not apply the Geneva Convention to non-Europeans. The test is not whether Turkey is more dangerous for certain people than for others - rather the safety of Turkey must be assessed for each individual applicant. The text of the Directive does not suggest some sort of comparison with others has to be made. I entirely agree that claiming that Turkey is a 'safe third country' does not make it so, and agree that there is a strong case to be made that Turkey does not meet the criteria to be defined as ‘safe’. I think that part of the point that you were making in your piece, however, is that the EU-Turkey statement was incorrect even in its own terms in stating that ‘all’ migrants would be returned to Turkey. What I was trying to say was that if the EU had rather stated that ‘almost all’ migrants will be returned, then given that it is the position of the EU that Turkey is a safe country this would have been consistent with its own proposed legal framework. I guess what I should have said is that even if the EU’s legal and factual analysis is correct this will not provide for the return of all migrants arriving on the Greek islands to Turkey, but it will provide for the removal of almost all migrants. Regarding the question of whether Turkey actually is a safe country or not, as I understand it there are two primary elements that might be challenged. First, there is the matter of the “national designation of countries considered to be generally safe”, i.e. whether the third safe country concept “may be applied to a particular country”, in this case Turkey – Article 38(2)(b) Common Procedures Directive. If your position that EU law requires Geneva Convention ratification without geographic limitation is correct (or if various other legal or factual situations pertain), then Turkey is not a safe country full stop, never mind the particular circumstances of any individual. Second, if it is the case that Turkey does in fact qualify as a safe country for refugees in general, then the only way any given applicant could prevent return to Turkey would be to successfully make the case that there are special circumstances pertaining to that individual that mean that in this particular case Turkey is not safe. I absolutely take your point that the test is not whether Turkey is more dangerous for certain people than for others. I phrased that badly. It is an individual test regarding the circumstances of each particular applicant. In practice, however, if the factor that prevented Turkey from being safe for one particular applicant applied to all or most other applicants, then in effect this would be mean that Turkey is not a safe country for refugees or asylum seekers at all. Therefore, if it is the case that Turkey is safe in general, then the test becomes whether there is some extra element that makes Turkey unsafe for a particular applicant. An example off the top of my head might be if an applicant were a Kurdish rights activist (though of course the case would need to be argued and evaluated). Is this correct, or have I misunderstood or missed something? It appears, therefore, that at the application for protection it is guaranteed that the applicant will be able to contest the second element – whether Turkey is safe in his or her particular circumstances, but it is unclear whether the applicant will be able to challenge the first element – whether Turkey may be designated as “generally safe” (is there another forum akin to the common law judicial review whereby someone could challenge the process at the policy level, either in Greece or at the EU level?). Given the situation it seems likely that the authorities will employ as restrictive an implementation as the law allows. Of course, if every applicant were to challenge the safety of Turkey in his or her particular case on a ground that in fact applied to all applicants, for example on the matter of geographic limitation, and this were to be accepted by the officials conducting the hearings, this would prevent all removals to Turkey. This would end up having the same effect as ruling that Turkey may not be “considered to be generally safe”. However, while it is possible that all Greek officials implementing this policy could decide that Turkey is not in fact safe for any applicant, it seems highly unlikely to me. Given that the “rules on the methodology by which the competent authorities satisfy themselves that the safe third country concept may be applied to a particular country” are to be “laid down in national law”, it seems far more likely that if the Greek officials are instructed by the Greek authorities that Turkey is to be “considered to be generally safe”, the officials will act in accordance with this instruction (though of course, you never know). If this is the case, then it follows that an individual applicant will not be able to successfully challenge his or her return to Turkey on grounds that would apply to all applicants. He or she must be able to demonstrate that there is some extra element that makes Turkey unsafe for this particular applicant in his or her specific circumstances. Given that it is unlikely that many applicants will actually be able to do this, it further follows that the great majority of applicants who get as far as having their cases heard will be returned to Turkey. Does this make sense? What I am not sure about, if this picture is correct and it is not possible do so at the level of individual asylum applications, is how one might challenge the designation of Turkey as a generally safe country at the overarching policy level. I am sorry that this comment/post has got so long, but I would be interested in hearing (reading) your thoughts. *Or would the supremacy of EU law mean that Greek officials would be obliged to implement the strict prescriptions of Article 38(1) of the Common Procedures Directive over the rules to be laid down in national law in Article 38(2) if the latter do not comply with the former? I would agree with the first point (need to show particular circumstances if Turkey is safe in general). Logically the EU Charter rights (both the substantive Article 19 and procedural Article 47) should allow a challenge in the courts as to whether Turkey is safe in general. Even if that's not possible each individual applicant would be able to challenge that Turkey is safe for them. I am referring here to judicial challenges to the inadmissibility decisions under Article 46 of the procedures Directive. If the national law referred to in Article 38(2) is incompatible with EU law then it would have to be set aside by the Greek courts. Okay, so to be clear, the procedure would be as follows. An applicant would claim in his or her hearing that that Turkey is not safe in his or her particular circumstances because the possibility to receive protection in accordance with the Geneva Convention does not exist. If the official hearing the application accepted this then the individual applicant could not be removed to Turkey. However, the implication of this is that the same will apply to every single applicant not dismissed on the merits, so it effectively rules that the Greek government’s assertion that Turkey is a safe third country in general does not conform to the requirements of the Procedures Directive. On this basis, all returns to Turkey would be halted (except where a claim is found to be unfounded on the merits), effectively killing the plan to remove refugees before it even really gets underway. I guess there might be issues around whether different initial hearings or appeals arrive at different conclusions, possible appeals by the Greek government if this is provided for, etc., but this is the gist of it? That's how it would work if the argument about how to interpret the 'safe third country' clause is successful. There is however an alternative argument that Turkey is a 'first country of asylum' for some refugees, in particular Syrians who get a different status than others there. That rule is worded differently so it might be arguable that Turkey's geographical limit on the Convention doesn't matter in that case. Yeah, I was worried about that one too, especially if any arriving Syrian has already received the formal Temporary Protection status in Turkey. Might be able to side step the whole Geneva Convention issue entirely. Seems to me that in that case one would have to argue on the facts that a returnee would face a real risk of conditions amounting to ill treatment, which might be significantly more difficult. The first country of asylum clause (Article 35 of the Directive) says that it applies either if the person 'has been recognised in that country as a refugee and he or she can still avail himself/herself of that protection' or 'he or she otherwise enjoys sufficient protection in that country, including benefiting from the principle of non-refoulement'. I think the first clause can only apply to Convention refugees (although some would disagree); but the second clause can apply to States which don't apply the Geneva Convention. The key question is what is 'sufficient protection'? I think it goes well beyond a risk of ill treatment, and means that someone must in most or all respects be treated as equivalent to refugee status. I hope you are right. I was probably being overly pessimistic. However, the fact that the term ‘sufficient protection’ is not defined seems to make it a deliberately flexible term. I can see that if your contention that non-geographic ratification of the Geneva Convention is required for safe third country status, then the similar language about being recognised as a refugee in Article 35(a) would also likely require this. It would probably follow from this that the “sufficient protection” element in Article 35(b) would mean something like a similar order of protection but not requiring formal refugee status under the Convention. However, if it were held that safe third country status under Article 38 does not require full Geneva Convention status, but only that the protections set out therein are available in practice, then the concept of ‘sufficient protection’ would be something lower than that. In this case, the inherent flexibility in the term might be bent quite a long way. The fact that the clause only makes reference to the fundamental protections set out in Article 38(1) optional, including the requirement that there is no risk of serious harm, is worrying to me. It seems that if harshly implemented it could be used to argue that the subsidiary protection criteria need not be taken into account. As far as I can see, the only protections that we can be absolutely 100 per cent certain apply are the prohibition of removing someone where there is a real risk of torture or ill treatment under Article 3 ECHR or there is a real risk of persecution as per the Geneva Convention. This is a very pessimistic worst-case scenario, but it is all I can see that is absolutely guaranteed. I must confess I have not read your analysis regarding the requirement of Geneva ratification yet. I will do so tomorrow. I think there is a clear distinction between the concept of already having asylum ('first country of asylum') and the mere possibility of asking for it ('safe third country'). If, as some claim, the latter concept can apply as long as a country applies the protections of the Geneva Convention in practice, then 'sufficient protection' must surely be interpreted consistently with that. The grammar of Article 35 of the Directive also suggests that it must be something very similar to actual refugee status. I think that the word 'sufficient' must have a standard EU-wide meaning - it can't be 'sufficient' that children can't go to school, or that the person concerned is homeless, hungry and unable to work, and is only protected from being removed to an unsafe country but no more. Yes, that all makes sense. Thanks for that. A summary for the rest of us would have been nice. An Abstract at the beginning, perhaps? So how do the ongoing attacks by Turkey at sea, of migrant boats, fit into these points? Perhaps I missed it, but #3 seems to only refer to inhibiting 'new' routes? I think it's simply assumed that Turkey will still try and stop the existing crossings. The documented existence of these attacks could be relevant in an argument about safety in Turkey though. Fascinating article - I read the draft and then the final versions of this agreement, and was thinking that I must have missed huge swathes of international and refugee law going away quietly. My mental reaction was along the lines of "huh?" So glad to see the details of "huh?" expressed so clearly. My second thought was that there is no way in a million years Greece is going to be able to actually deal with these asylum claims. And these "4,000 officials" from the EU, how on earth will that work? If they have to work in Greek, that rules out almost all non-Greek lawyers, judges, and administrators. If it is in English and / or French, what happens when Appellants want to access the Greek legal system? And how on earth will those 4,000 know anything about Greek law anyway? Sounds like a recipe for chaos. Thanks for your comments, Amanda. Perhaps a Greek reader can comment on the legal and practical obstacles of officials from other countries providing a kind of de facto asylum administration in Greece? Steve thank you for this informative post. Under the procedures directive Article 46(6)(b) an asylum applicant who falls into the inadmissibility categories found in Article 36(2)(a), (b), or (d) is not granted the right to remain in a territory until the "time limit within which to exercise their right to an effective remedy has expired and when such a right has been exercised within the time limit,pending the outcome of the remedy." Notably this excludes 'inadmissible' applicants from 'safe third countries' but it does include applicants from 'first countries of asylum. 'My question is Greece has to my knowledge only acknowledged Turkey as a 'safe country of third passage' and not as a first country of asylum' does this mean that they cannot send applicants back until after they have received effective remedy which would include a hearing and decision by a first instance court? Thanks. It is a bit unclear exactly what Greece is doing. Certainly the Commission is promoting the 'first country of asylum' possibility. But correct to stay that if it is applying 'safe third country' there is a full suspensive effect of an appeal in all cases. That depends what 'sufficient protection' means. If it means essentially the same treatment as the Geneva Convention then the gap is not so wide. I think the assumption was that if someone already has protection then there's less need to worry about protecting them from being removed pending appeal. According to the UNHCR, Greece will be applying the ‘first country of asylum’ principle for Syrians or stateless persons normally residing in Syria predicated on the fact that they have access to the ‘temporary protection regime’ in Turkey. I would question the legality of this on the basis that the protections of the temporary protection regime fall a long way short of those required under the Refugee Convention, and as such do not amount to ‘sufficient protection’. Also according to the UNHCR, Greece will be applying the ‘safe third country’ principle for non-Syrian and non-European refugees and asylum seekers on the basis that they can apply for ‘conditional refugee’ status under Turkey’s regular asylum laws. This is not formal refugee status under the Convention, so Steve’s argument about the necessity of formal non-geographic ratification comes into play, and though the protections are closer to those of the Convention than those under the temporary regime for Syrians they still fall short in some regards, so I would argue that this does not amount to protection ‘in accordance with the Geneva Convention’. I'm a lawyer from Syria and have my refugee status approved in Germany. It's quiet an article and I would like to ask you according to your legal expertise, should the asylum seekers in Greece challenge the deportation to Turkey in Greece courts or not? I know that it depends on each individual circumstances to challenge this deportation in courts, but what you would advise in general? Thanks for your question. Definitely I believe they should challenge the deportation, on the grounds listed above. Personally, I think that the most straight forwards challenge to the current deportations plan is that, as Steve notes, Turkey has not ratified the Geneva Convention for non-European refugees, and on top of this that the protections that are in place under Turkish law fall a long way short of those stipulated in the Geneva Convention. This is particularly the case with regard to the temporary protection regime for Syrians and stateless persons normally residing in Syria, where, for instance, employment and free movement rights are strictly curtailed by comparison to those provided under the Convention, but it is also the case with regard to the regular asylum legislation for non-Syrian and non-European refugees and asylum seekers. You could also address the factual likelihood that the protections received in Turkey will fall short, but then you will need to build a case providing evidence etc., which will be more complicated. It seems to me that a simple side-by-side comparison of the Geneva Convention and Turkish law is the easiest way to demonstrate that Turkey does not offer ‘sufficient protection’ or ‘protection in accordance with the Geneva Convention’. Of course, Steve is the eminent professor here, so I demure to any comment he may make. I set the argument out in more detail on the Essex Justice League blog. There is a link in the comments above, under the question asked by Adam. Hello, I am an ordinary LL.M. student at the University of Essex. I would like to thank Professor Steve Peers for this illuminating post and make a consideration related to the lawfulness of this agreement. Legally speaking Turkey is not bound to the 1967 Protocol to the Geneva Convention on the Refugees Status, which means from an international law point of view that It is not bound to grant the Refugee Status to whom is not European. Consequently is hard to state that Turkey can be considered as a ‘first country of asylum’ for Syrian or Iraqi asylum seekers . This simply because under Article 35 of the European Asylum Directive Procedure (ADP) a country can be considered as a ‘first country of asylum’ if the applicant “has been recognised in that country as a refugee and he or she can still avail himself/herself of that protection; or he or she otherwise enjoys sufficient protection in that country, including benefiting from the principle of non-refoulement”. Although ADP does not define ‘sufficient protection’, pursuant to the EU Treaties, the directive must respect fundamental rights, including the right to asylum under Article 18 of the EU Charter of Fundamental Rights. It is not clear to what extent Turkey allows to enjoy such fundamental rights. Further, it is not obvious whether the right to an effective remedy before a court or a tribunal against the inadmissibility decision in accordance with Article 46(1)(a)(ii) or (iii) and Article 46(6)(b) APD will be granted. In particular, from the agreement’s wording what seems at stake the most is the applicant’s right to remain on the territory of the Member State, pending the outcome of the remedy. UNHCR recalls that the remedy against an inadmissibility decision must have automatic suspensive effect in law and in practice, where the applicant has an arguable claim of a risk of ill-treatment upon return or of arbitrary deportation from the country of return in accordance with Art.3 and 13 ECHR. So if under the EU Law it is tough to consider Turkey as a ‘country of first asylum’ and it has been argued (in the previous posts) that it is also difficult to say that It is a ‘third safe country’, how an automatic deportation of ‘irregular migrants’ (which include also those to whom the inadmissibility was based upon the aforementioned concepts) from Europe towards this country can be legal? Ultimately, what lacks completely in the agreement is a reference to the family unity needs and the best interest of the child. This unfortunately highlights the lack of humanity which permeates the entire agreement. Thanks for your comment, Tommaso. Technically the 1967 Protocol to the Geneva Convention lifted the time limit on the original Convention (it was originally limited to people who had status before 1951), not the geographic limitation. Turkey has ratified the 1967 Protocol. The geographic limitation comes from Article 1.B of the original Convention, which Turkey has invoked. I apologize for this technical mistake. Turkey ratified the 1951 Geneva Convention and its 1967 Protocol, but maintains a geographical limitation for non-European asylum-seekers, thus recognising refugees originating only from Europe. However, I believe that the legal substance remains the same, how can be retained lawful an instrument which allows to deport thousands of asylum seekers towards a country where it is not certain neither that their applications will be considered nor it could be deemed as a safe country. What struck me the most is this kind of automatic mechanism which apparently could permit to deport to Turkey all migrants whose applications can be considered inadmissible. In terms of this Turkey can be regarded not only as a third safe country but also as a first country of asylum. As a result a great deal of asylum seekers in Greece could see rejected their application and sent back to Turkey for this reason. Then the question arises: how many asylum seeker will be recognised as refugees in Europe through this 'humanitarian channel'? If the number resulted extremely low, would not be there a significant risk that those people look for other ways to reach Europe, in open contrast with the agreement's purpose itself to limit human smuggling? I am rereading your thorough analysis of the EU-Turkey deal as the first deportations are under way today. It seems that the authorities are under a duty to assess asylum requests and the pressing issue now, as you note, is whether people have adequate access to the asylum procedure. I am still wondering, however, who would be those Syrian migrants who would not qualify for asylum in Greece so that they can be exchanged for resettled Syrian refugees. It must be a rather small number of people. I would really appreciate your thoughts on this point. Thanks for your question, Rositsa. The assumption underlying the deal is that the Syrians should be staying in Turkey as it is safe for them. Obviously the question is whether they get access to the courts to challenge any such decisions, and whether they are successful. Thank you so much for your prompt response! But if the underlying assumption is that Turkey is safe for Syrians, why does the deal envision that the applications of those who arrive on the Greek islands will be registered and processed? Are they not reviewing them on the merits? They have to say they are reviewing them on the merits, but the overall tone of all the developments is that they think Turkey is safe for Syrians. Maybe they would make an exception for Kurdish activists. So far, the Greeks are not returning Syrians to Turkey, other than two women who went voluntarily today. It is unclear what will happen, because the Greek state does not have the capacity to process many applications, let alone quickly. What is perhaps equally interesting is that although the majority deported today were Pakistanis, there were also very small numbers from Somalia and Cote d'Ivoire. It seems unlikely to me that any has been through and legal examination of their cases -- therefore, the probability is that they did not apply for asylum. The question is, why? Who knows what people get told, or understand, about applying for asylum when detained, especially in light of language barriers? Rositsa – the key here is that under the terms of the deal those whose asylum applications in Greece are found to be unfounded or inadmissible will be returned to Turkey. One ground on which asylum claims may be found inadmissible is if the claimant has come from a ‘first country of asylum’ or from a ‘third safe country’. With regard to Syrians specifically, according to the UNHCR they are to be returned on the basis that Turkey is a first country of asylum, because Turkey has put a special ‘temporary protection regime’ in place for Syrians. I personally do not think this regime will legally suffice because the protections fall a long way short of those set out under the Geneva Convention, but this is what they are planning. If you are interested, I have set this out in more detail in a blog on the Essex Justice League blog forum. There is a link in the comments above, under the question posed by Adam. I went back to this and some other articles of yours in the hope of finding an answer to a quite basic question I have about the Return Directive. I have to admit that I am still struggling, and I was hoping that you would comment. Thanks for your comments. There's no ECJ case law on this, so no obviously correct answer. In my view it depends on the appeal provisions of the asylum procedures Directive. If the final appeal is rejected, or if the appeal is not suspensive, then the Returns Directive applies. So you need to examine in which cases an appeal against an inadmissibility decision is suspensive or not. Thank you very much for your prompt reply! Just to make sure I understand correctly, once the final appeal is rejected (ie, once the rejection decision relating to the asylum application becomes final/no longer appealable in the relevant EU host country), the Return Directive applies, even where the rejected asylum seeker is actually in need of international protection but was rejected on the basis of, for example, the first country of asylum rule (eg, he/she was in non-European country X and had appropriate protection there for a year before deciding to move on to Europe). I recently read the debate at the European Parliament relating to the adoption of the Return Directive (I am a PhD student) and the proponents of the directive express clearly that the directive has nothing to do with people who need protection. But it looks like it actually applies/can potentially apply to the return of people who need protection (to a transit country where he/she can get that protection), unless the ECJ decides that it does not, considering the original purpose of the directive. I think I have been looking for an express statement in the law (Return Directive or somewhere in the EU asylum acquis) to the effect that those who need protection are excluded from the scope of the Return Directive but could not find it. I assume this is the correct interpretation, but there is no confirmation yet. Indeed an asylum application may be inadmissible on 'safe' country grounds even though the person does need international protection *somewhere* - that point isn't always understood. The ECJ has ruled on the relationship between the two sets of rules in Kadzoev and Arslan, but hasn't directly addressed this specific point. Thank you very much Professor Peers, I greatly appreciate your response.